In pursuant to Court of Criminal Appeals Order 16-003. Electronic filing will be mandatory in all Criminal Cases in the Webb County District Courts and County Courts at Law. Visit http://www.efiletexas.gov/ for more information or call (956) 523-4268. Thank You. On July 1, 2014, mandatory e-Filing will begin in the Webb County Civil District Courts and County Courts at Law. It will be mandatory for attorneys to e-file on all civil and family cases in Webb County. 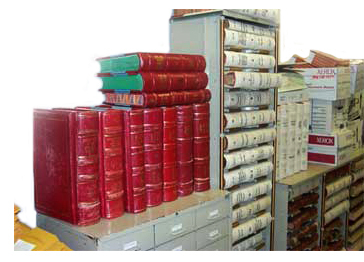 The office of District Clerk has been included in every Texas constitution since the Republic was formed. The duties of the office have, however, grown more complex and varied. 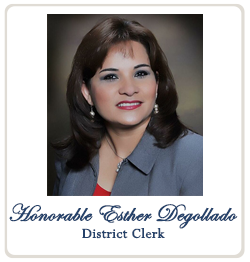 The District Clerk provides support staff for the District Courts and the County Courts at Law and works with the Judges to obtain timely disposition of all court cases. She is the registrar, recorder, and custodian of all court pleadings, instruments, and papers that are part of any cause of action in civil or criminal district court. 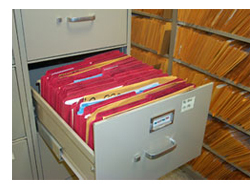 The office indexes and secures all court records and accounts for all monies paid as deposits on civil cases awaiting disposition and all funds awarded minors in court actions that are paid into the court registry. The role of the District Clerk in supporting the court system is essential to its smooth operation and, as an officer of the court, the District Clerk is authorized to issue a variety of processes - the most common being the capias, or warrant. Aside from providing clerical support, both in and out of the courtroom, the District Clerk has the responsibility of overseeing the accounting and disbursement of all child support payments for cases heard in Webb County. This amounts to approximately 10,000 cases and over $8 million dollars yearly. The District Clerk is responsible for gathering data and reporting to several local agencies including the County Auditor, County Treasurer, Voter Registration, Department of Public Safety, Attorney General, Supreme Court of Texas, and the Office of Court Administration, among others. The District Clerk also acts as the officer in charge of jury selection to determine the number of potential jurors required to begin a trial. Being responsible for every stage of the jury duty process, the District Clerk sends summons to jurors, processes them on trial day, and acts as a liaison between the jurors and their employers.